Long celebrated by their fans as a hard-driving blues/rock duo, Shawn Hall and Matthew Rogers — a.k.a. 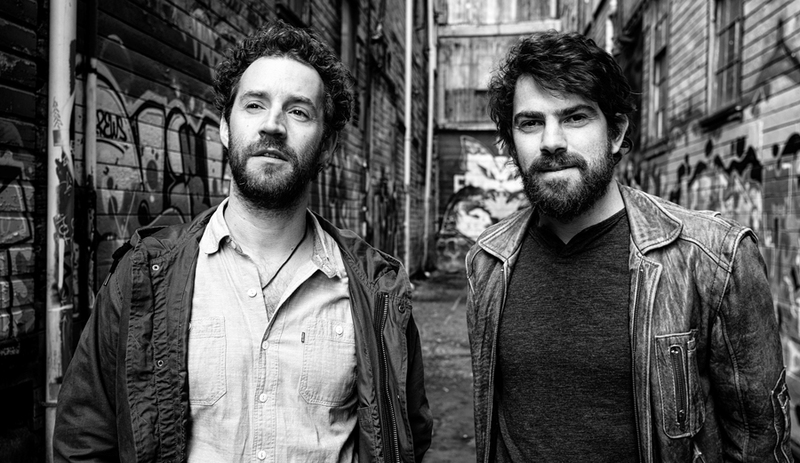 The Harpoonist & the Axe Murderer — recruited reinforcements for their follow-up to 2014’s Juno-nominated A Real Fine Mess. Apocalipstick’s 13 tracks include contributions from John Raham (The Be Good Tanyas) on drums, Geoff Hilhorst (The Deep Dark Woods) on keyboards and Andrina Turenne and Alexa Dirks (Chic Gamine) on lead and backing vocals. Song-writing for the album was a group effort too, says Rogers. Apocalipstick was recorded at historic Afterlife Studios in Vancouver. In addition to drumming on Apocalipstick, Raham served as co-producer. “We gave him a rough idea of the beats we liked, but he had some pretty strong ideas himself,” says Rogers. “So as far as the grooves and rhythm section goes, it was definitely a collaboration. As might be expected from the album title (at least, the first half), Apocalipstick delves into some dark themes — most inspired by the current state of the world. The album is far from defeatist, though. That’s where the “lipstick” part of the title, and the accompanying cover image of a pair of psychedelic lips on a black background, comes in. “It represents the idea that even though things are going to hell in a handbasket, something like a night on the town or enjoying something fun or frivolous can juxtapose how dire things feel sometimes,” says Rogers. Hall and Rogers won’t be joined by all their studio collaborators on the tour but they will have a juiced-up line-up. “Normally, we record albums, and make them the best that we can, then we have to learn how to translate that to just two people,” says Rogers. “On this tour, we’re doing something we’ve never done before, which is adding a drummer. Usually, it’s just me playing drums with my feet. I’m still going to do that, but we’re adding a drummer who also plays keyboards so he’s another multi-tasker. The tour stretches from B.C. to Ontario and goes until late April. After that, says Rogers, the plan is to play some Canadian festivals this summer, then head over to Europe in the fall. “We recently toured the UK with a band called St. Paul and the Broken Bones. We were opening for them, so were playing some of the biggest shows we’ve ever played and reaching a lot of new fans. One place Hall and Rogers won’t be touring any time soon, though, is the United States.